Because they are not only grandparents … they are “grand” as well. It was another downright cold September morn, and I tweaked the heat to nudge it up a little higher to take the chill out of the house. That was for my canary Buddy, even though he was bundled up nicely in the room where he sleeps. But, I confess I enjoyed that rush of warmth circulating as it enveloped the house, making it feel nice and cozy. It was only 48 degrees when I headed out the door in my same garb as yesterday, but after a minute, I dashed back inside to grab a cardigan. While buttoning it up, I thought of my mom who often dispensed such pearls of wisdom like “always take a cardigan with you because it’s easier to take it off than wish you had brought one along” … yup, she had a point, but I figured that by the time I returned home from my walk, that cardigan would either be carried or slung around my shoulders. I walked along thinking about all those pearls of wisdom I received through the years, and I guess my grandmother passed them along to my mom originally. So, that line of reasoning, of course, got me thinking of my grandmother, Minnie Goddard, for the second time today – the first was because the radio announcer reminded the listeners that today was National Grandparents Day. When this “Hallmark holiday” first began, I remember sending my grandmother, whom I called “Nanny”, a card for the occasion. At that time, I didn’t know that Grandparents Day wasn’t celebrated in Canada. When we spoke on the phone the next time, she thanked me for the card, but was perplexed a bit why I sent it. “Just because” was my answer. The next time we went over to visit her at her house in Toronto, the card was still standing up on the top of her fridge. She said all the neighbors wanted to know what Grandparents Day was and I would need to tell them all about it. I missed the best years of Nanny’s life, when she was vibrant and full of energy, because my parents were thirty years old when I was born, and she was already over 50. Then, because our houses were “GU”, a/k/a “geographically undesirable”, when we lived in the suburbs, in Oakville, I only saw her about once a month on a Saturday or Sunday. Then, when I was ten, we moved to the States and only travelled to Toronto to visit her about three or four times a year. I recall she worked very hard, and many hours, standing on her feet all day except for break times. So, she was pretty tuckered out by week’s end. When she and my grandfather were raising their kids, they worked different shifts at big factories in the City. My grandfather worked for a company that made rubber boots and my grandmother worked at Rowntree’s and also at Planters Peanuts. I remember my mom saying that Nanny’s work clothes at both factories were a simple dark uniform, covered by an apron with huge pockets. At Rowntree’s, a candy factory, the employees got to keep all the misfit candy that they sorted off the conveyor belt. This included chocolate with uneven drips, misshapen Mackintosh toffees, the broken or chipped lighter-than-air Aero bars and more Smarties than one could ever imagine. Smarties were the equivalent of plain M&Ms. My mom said she used to play tiddlywinks with them when she was a kid. While working at Planters, my grandmother’s apron would reek of peanut oil and salt trails would be evident where the seams would split from pockets filled to the brim with less-than-perfect peanuts, because, as you may suspect … Mr. Peanut has always been rather persnickety about his wares. In later years, she worked in food prep at a large cafeteria downtown. She’d be on her feet from 7:00 a.m. until mid-afternoon, then she’d traipse over to grab a streetcar to come home. She’d plop down on the seat, and nearly every night she’d nod off, miss her stop and sometimes ride back downtown again. She waited much too late to retire, because by then she was plagued by heart problems which slowed her down to a crawl. Though she had earned the right to sleep in, she never did, blaming her early rising on years of getting up at the crack of dawn for work. She was content to watch her “soaps” on television every afternoon, often nodding off and missing half of the episodes. One of her favorite gifts I ever got her was a subscription to “Soap Opera Digest”, a weekly magazine which recapped all her favorite shows and the important portions missed while snoozing. Nanny has been gone nearly thirty years now. On Grandparents Day, or her birthday, I like to think of the pleasant or light-hearted memories I have, like sitting in the living room together watching “rasslin’” which was broadcast from Maple Leaf Gardens with such greats as Buddy Rogers, Bruno Sammartino and The Sheik, or holding her hand while walking up the steep hill from her house to St. Helen’s Church on Sunday mornings. I’ve written before about how she loved her garden and we would go out back and she’d whack off a piece of rhubarb and come in and wash it and pour some sugar for me to dip the stalk, still warm from the sun, which made for a tangy treat. The photo above was taken in June 1978 when I received my BA in Mass Communications from Wayne State University. 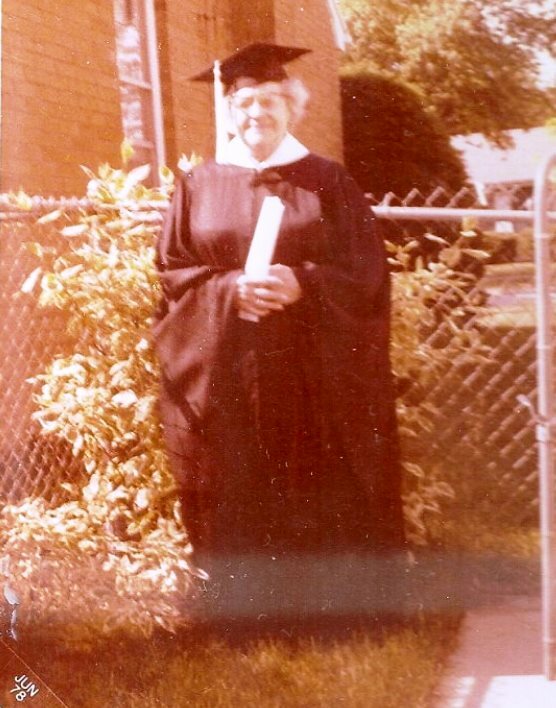 Just for kicks, my grandmother donned my graduation gown and mortarboard and clasped her honorary “degree”, a rolled-up sheet of paper. Perhaps you recall the Oscar acceptance speech by actor J.K. Simmons, who hails from Grosse Pointe, Michigan. He thanked his family and dispensed some wisdom … a tribute to his own parents. Do it right after you finish reading this post. I know I wish that I could. 4 Responses to Because they are not only grandparents … they are “grand” as well. Miss Linda…………………….you mean your nana’s name was Minnie Goddard? Maybe goddard Rd. was named after her!………………………. Ann Marie – Yup … her last name was Goddard. That’s the same thing my mom said the first time we drove up Goddard Road. She called her mom to tell her about the street name. Boy Linda this was great. I, too wished I knew my grandparents. So Happy Grandparents Day to all grandparents. Thanks Marge – yes, she was special. I have to look and see if I ever wrote about taking her to Greenfield Village. It seems I did already. But one year she came to visit when it was just my mom and me. She came for about a month. I had some vacation time off from work and my mom was wondering where we go, like for “sightseeing”. We decided on Greenfield Village, but my mom didn’t go along. So we got into an area of the museum that has all the big farm implements. Now if my mom never told you this, my grandmother was raised on a farm in Ariss (near Guelph). So, she had a whale of a time walking around and touching all the big farm machinery. Then we went to where all the vintage clothing was and she was pointing out “I wore these button shoes” or “I had a dress like that” … she talked about going to Greenfield Village for weeks afterward.